Exact and Smart Profile have been successfully working together for several years. When the decision was made within Exact to expand the Lead Development Team, Smart Profile was contacted. “With the clean data from Smart Profile, we match and enrich data within our own systems, which means we are able to find projects in the market faster. In addition, we wanted to use Smart Profile’s expertise as a flexible layer to supplement our own team, ”says Ruud Roosemalen, team lead at Exact. Smart Profile business development specialists work from their location in Breda or at the customer’s location. Exact lets the experts on the floor cooperate with their own team as a flexible layer. “The Smart Profile business development specialist delivered measurably good results,” Ruud adds. The reason for the good results is the combination of expertise and tooling at Exact, supplemented with the market intelligence from Smart Profile. In essence, the insights from Smart Profile’s database are used as a basis. Subsequently, activities based on this market intelligence are processed directly in Exact’s systems. The collaboration shows that Smart Profile business development specialists are a valuable addition to any B2B marketing and sales team. Whether that happens from the locations in Breda and Zaventem or on location at the relevant customer. “I would definitely recommend Smart Profile to B2B organizations that are looking for a successful demand generation partner: Smart Profile speaks our” language “, which means we can switch quickly and deliver what we are looking for. Smart profile delivers achieved results in a structured way, so that they can easily be integrated into our tools. This method provides us with insights to further optimize our processes and marketing, which also has a major positive strategic effect, ”concludes Ruud Roosemalen. “Given the current data that can be used directly from the Exact systems and the expertise of the business development specialists, Smart Profile is clearly more than a telemarketing agency. Another important positive point of Smart Profile is the flexibility. They can respond quickly and adequately to our requests. For example, capacity was recently released quickly at Smart Profile in Breda for the implementation of a demand generation campaign, whereby the campaign results could be registered directly in our systems. A short effort with a major positive effect, “concludes Ruud Roosemalen. Exact is a forerunner in financial and business software for small to medium-sized companies and accountants. More than 400,000 companies rely on Exact software for their business figures. 366,000 of them do this in close collaboration with one of the 5,630 affiliated accountants. The Exact ecosystem, which consists of 275 Value Added Resellers, enables the integration of more than 700 business apps in the software. 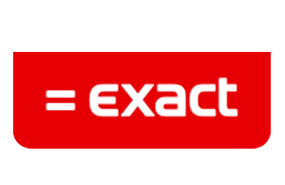 As a result, you will find a suitable solution at Exact to manage your business figures. Our 1,400 employees serve SMEs and accountants by continuously delivering innovative solutions that make a difference to their business every day.